Sorry... the 2017 BMW X5 is no longer being sold as new. 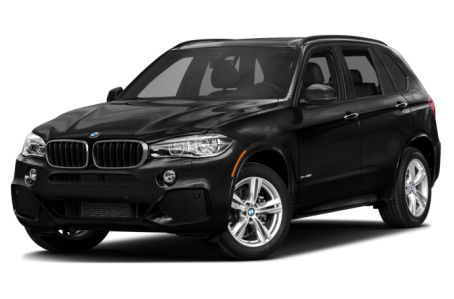 Instead, take the first step to a great deal on 2019 BMW X5 with a free price quote! The BMW X5 midsize crossover SUV seats up to seven when equipped with an optional third row. Competitors include the Audi Q7, Mercedes-Benz GLE-Class and Volvo XC90. A turbocharged gas six-cylinder engine is standard, but the X5 also offers a turbo-diesel engine, a turbo gas V-8 and a plug-in hybrid in the xDrive40e model. BMW also sells a high-performance variant, the X5 M.
The standard iDrive control system gains a touch-screen while wireless smartphone charging and a Wi-Fi hot spot are available. New standard exterior trim includes stainless-steel underbody cladding, a matte-silver grille and rocker panels, and satin-aluminum roof rails and window trim. The plug-in hybrid version of the X5 gets an EPA-estimated 24 mpg in combined driving and is powered by a four-cylinder gas engine and electric motor. It can travel up to 14 miles on electric power alone when the lithium-ion battery pack is fully charged. The high-performance X5 M is powered by a twin-turbo 4.4-liter V-8 engine that makes 567 hp and 553 pounds-feet of torque. The engine works with an eight-speed automatic transmission and power is routed to all four wheels. BMW says the X5 M can hit 60 mph in just 4 seconds. As to be expected of a performance offshoot, the X5 M wears unique bumpers, aggressive side sills and highly bolstered sport seats. 18 of 20 (90%) consumers said they would recommend this vehicle to a friend.